席永慧, 杨帆, 蔡策毅. 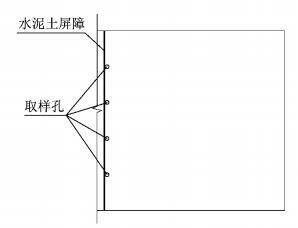 垃圾填埋场中水泥土屏障对Cu2+的阻滞性能[J]. 同济大学学报(自然科学版), 2018, 46(7): 899-904. 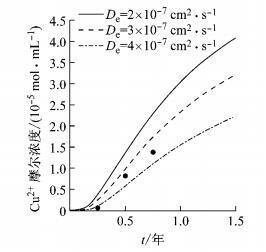 DOI: 10.11908/j.issn.0253-374x.2018.07.006. 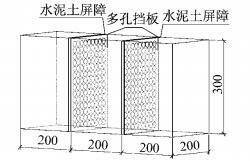 Abstract: In this paper, the effects of cement-soil barrier with different cement content and bentonite-sand-cement (plastic concrete) barrier used in Shanghai Laogang landfill are studied through the laboratory model test. 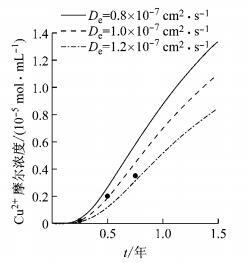 The effective diffusion coefficients of copper ions in the impervious barrier are solved by using numerical simulation method. 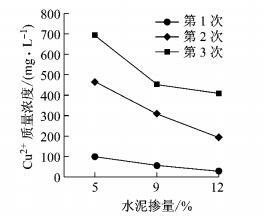 The experimental results showed that with the increase of cement content and barrier thickness, the blocking effect of the cement-soil barrier on metal ions will be increased gradually. 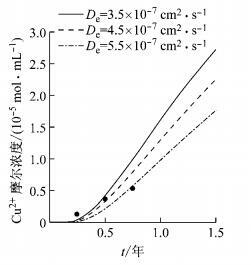 The effective diffusion coefficient (1×10-7~4×10-7 cm2·s-1) of copper ions in cement soil is 1/25~1/100 of the effective diffusion coefficient in soil (9.53×10-6~1.14×10-5 cm2·s-1).The plastic concrete impervious barrier used in Shanghai Laogang landfill has good blocking effect on copper ions. 根据一维扩散理论，设计试验模型如图 1所示.此模型由聚氯乙烯(PVC)板加工而成，板厚10 mm.模型的内部尺寸如图所示，长、宽、高分别为600、200、300 mm.模型内腔分为三部分，由左右各三分之一处设置水泥土屏障分隔开来，中间仓放置污染液体，其长度为200 mm，远远大于屏障厚度；两边仓长度为200 mm，在其中填装未受污染的净土.在距离箱体两端200 mm处，各设置了孔隙率达到50%以上的由PVC板加工而成的挡板，此挡板目的在于加强箱体的侧向稳定性. ① 模型的制作.按图 1加工PVC模型；②材料的准备.胶水、自然风干的土样、水泥；③屏障的预制.按照表 3将土和水泥混合均匀，在模板中养护成型；④屏障的放置.将制作好的屏障放置在净土侧，并用胶水固定在PVC板上；⑤土样的夯实.将土样倒入模型两端空仓中，分层夯实；⑥土样的饱和.土样夯实后，为模拟自然固结过程，每天向土样中加入适量水，直至土样饱和；⑦钻孔.待两边仓土样饱和后，按图 2所示位置钻孔，以便以后取样；⑧污染源溶液的加入.待两侧净土固结完成后，配置浓度为0.3 mol·L-1的CuCl2溶液，将其加入中间仓.⑨取样.每隔三个月从预先钻好的孔中(图 2)取得水样；⑩浓度的测定.将取得的水样(或泥浆样)在离心机上进行离心，取其清液进行稀释，然后利用原子发射光谱仪测(ICP)清样中的Cu2+浓度.每个样品平行测定三次然后取其平均值. 图 3是厚度为10 mm，水泥掺量分别为5%、9%、12%的屏障三次取样浓度比较结果.三次取样的浓度曲线表明，随着水泥掺量的增大，取样孔中Cu2+质量浓度大幅减少，说明屏障的阻滞效果大幅提升，净土中受污染程度大幅降低.以第一次取样为例，当水泥掺量为5%，取样孔中Cu2+质量浓度为98.34 mg·L-1；当水泥掺量增加至12%时，取样孔中Cu2+质量浓度为29.5 mg·L-1.由此可见水泥掺量增加2.4倍，取样孔中Cu2+质量浓度降低了约3.3倍. 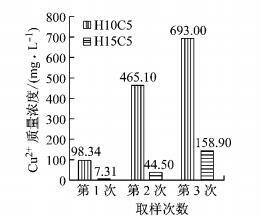 图 4是水泥掺量同为5%，厚度不同的屏障的两次取样质量浓度的比较结果.可以看出，随着厚度增加，取样孔中Cu2+质量浓度降低，说明阻滞效果随之提高.以第三次取样结果为例，当厚度为10 mm时，取样孔中质量浓度高达693.00 mg·L-1；当厚度增至15 mm时取样孔中质量浓度降为158.90 mg·L-1.由此可见厚度增加1.5倍，取样孔中Cu2+质量浓度降低了约4.4倍.对比增加水泥掺量和屏障厚度对屏障阻滞效果的影响，可以看出此结果与乔兵等所得试验结果较为相符，铜固化淤泥孔隙直径以0.1~1 μm为主，增加水泥掺量不能有效降低其孔径大小，所以水泥土中盲目增加水泥掺量并不能够使水泥土屏障的阻滞效果达到质的提升，反而会降低其经济性. 本文采用有限差分数值方法，运用Matlab软件，依据式(5)~(10)编制程序对试验数据进行模拟.席永慧等研究得到Cu2+在土中的有效扩散系数为9.53×10-6~1.14×10-5 cm2·s-1，模拟时，Cu2+在土中的有效扩散系数(De2)取为1.0×10-5 cm2·s-1.模型H10C5、H15C5中Cu2+浓度和时间t的关系分别见图 5和图 6，对其拟合求得Cu2+在水泥掺量为5%的水泥土屏障中的有效扩散系数De分别为2.5×10-7、1.0×10-7 cm2·s-1.两组模型求得的Cu2+在水泥土中的有效扩散系数的结果接近，这说明本文的试验方法及计算方法均是可行的，计算结果是可信的. China statistical yearbook 2016[M]. Beijing, China Statistics Press, 2016. 中华人民共和国住房和城乡建设部. 生活垃圾卫生填埋场岩土工程技术规范: CJJ 176—2012[S]. 北京: 中国建筑工业出版社, 2012. Ministry of Housing and Ruban-Rural Construction of the People's Republic of China. Technical code for geotechnical engineering of municipal solid waste sanitary landfill: CJJ 176—2012[S]. Beijing: China Architecture and Building Press, 2012. 蔡策毅. 防渗屏障对重金属离子的隔离效果以及防渗系统的施工技术研究[D]. 上海: 同济大学, 2016. CAI Ceyi, Study on the isolation effect of the barrier against heavy metal ions in landfill and the construction technology of the seepage control system[D]. Shanghai: Tongji University, 2016.